An award winning and highly creative textile designer Kayleigh creates embroidered and embellished designs for the fashion market. She is highly skilled in her ability to design and produce commercially viable designs from artwork utilising extensive hand, machine and digital embroidery. Kayleigh recently completed her MA in Textile Design Innovation at Nottingham Trent University where she received a Distinction for her work. During this time she explored how traditional embroidery techniques can be used with modern technology to create innovative designs. As a part of this she investigated how smart textile applications, e-textiles and 3D printing can be used alongside a range of embellishment techniques. From this she has developed a wider skill set for creating her designs including tambour beading, goldwork and using Wilcom for digital embroidery. For designing Kayleigh has equipped herself with several specialist machines to assist in the production of her designs giving her the ability to produce a wide variety of work covering more specialist techniques. 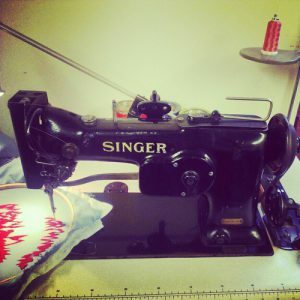 This equipment includes an Irish embroidery machine, Embellisher and a range of attachments for manipulating fabric for her sewing machine. Kayleigh is also receiving sponsorship from Wilcom and so is able to produce digital embroidery designs ready for production using Wilcom Embroidery Studio E4. Kayleigh won 1st prize in the Hand & Lock Prize for Embroidery 2017 in the Wilcom Fashion Category and was also nominated for inclusion in Texprint 2017.